Captain Sherman (James Best) and his first mate, Rook (Judge Henry Dupree) arrive via boat to deliver supplies to a group on a remote island. Automatically there seems to be some tension among the island dwellers, who seem eager for Sherman to leave, but an approaching hurricane forces them together. As luck would have it, Dr. Marlowe Cragis (Baruch Lumet) has been working on a way to make humans half normal sized and thus reduce their food consumption for the betterment of the planet. This experiment has gone wrong, and now the island is over run with his former test subjects; shrews which are now big, aggressive and highly poisonous. The group struggles to fortify their position, but one by one they are falling to the Killer Shrews. 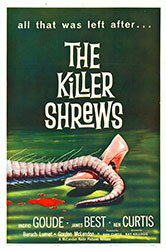 The Killer Shrews is a staple of public domain horror collections, and unlike many films that fall into that category, it’s still very watchable. The actual plot doesn’t really take hold until nearly a half-hour into an already short movie, but there is a rising sense of danger from an unseen threat. Unfortunately that threat comes in the form of coonhounds with carpets draped over them, which undermine any tension that was built up prior to their appearence. There are some puppets used for close-up shots and those are much more successful. For all its special effects problems, The Killer Shrews is great at cranking up the pressure on our characters as they come under siege, and in the end it’s an entertaining and original film in the twilight days of 1950s science-horror.